Please scroll down to purchase evo.OTware, evo.millennium, evo.pen Darwin, and evo. cartridges . Thank you. The eronomic silverware, 15 degress up, 30 degrees in. They work! 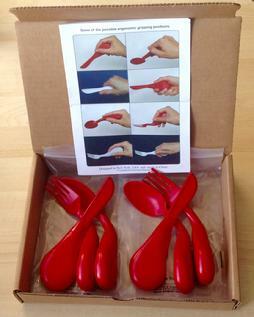 evo.OTware knife, fork, and spoon set. Dishwasher safe, they will provide years of service. Developed using the Space Age material, Eastman Tritan. It is FDA approved for repeated use food articles. Latex Free. Phthalate Free & BPA Free. Order multiple sets. Makes a great gift, and a release for caregivers...Click Paypal just below. 2 Full sets of evoOTwae. 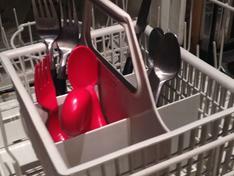 One for the table, a back up in the dishwasher. 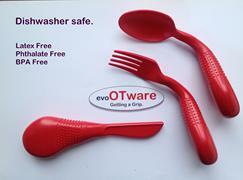 evoOTware 2 sets Dishwasher safe, FDA approved material. P&H Incl. PD, RA, Dementia, MS, and other maladies. Get a grip. 2 Paks of 3 cartridges. Tungsten Carbide Ball in a brass seat. Also for left handed people. Identical to right handed, but for lefty's. Of which I am one. Just click on the "Buy Now" button on your right. Thank you. The order button is just below. Thank you. OTware HOME SET of 12 pieces. 4 of each,spoon, fork, and knife. Many people keep multiple sets of their daily living aids. Tested to over 500 dishwashings. evo.millennium. Carried in the MOMA Design Stroe for 15 years. Heavy chrome plated mirror finish. A beautiful minimalist ergonomic invention. The evo.pen and models werre accessioned into the permanent collection of the Smithsonian Museum. The evo.millennium comes packaged with 2 extra blue writing cartirdges. Tungsten carbide ball in a brass seat, with brass inner tubing. The finest ball point made. Also chosen as a great gift for the Season by Pen World mgazine. A proud note, the pen received an "ease of use" Commendation from the Arthritis Foundation. For Arthritis Sufferers and evryone else. Most ergonomic! evo.pen special sale. blue ink. Buy 2 get 3. Click on Buy Now! evo.pen 2 pack, blue body, Blue Ink. Click on BUY NOW below. 4 units 3-Pack cartridges. Blue ink. Replacement cartridges for all evo.pens, including the ergonomic Darwin and Millennium Pens. evopen 3 pack blue cartridges. evo.millennium solid, chrome plated. Fits standard evo.pen cartridges. Click on Buy Now on top of Page. evo.millennium 5 pack. Free Shipping. evo.pens Darwin Series are $7.50. blue ink. Please Add $5.95 for S & H per order. shipment to one location. Or click "Buy Now" on the right. Two-3 Pack Replacement Cartridges Blue Ink.